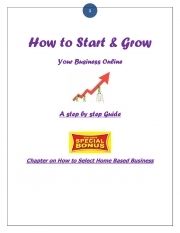 Description of "How To Start & Grow Your Business Online- A Step By Step Guide (eBook)"
This book explains in simple steps how one can start a website within one day and start selling anything online. It can be done by anyone without anybody's help. Tejash D Mehta hold Prestigious GAIQ Certificate and Is Internet Marketing Expert. Consulting Companies on how to increase sales online. Reviews of "How To Start & Grow Your Business Online- A Step By Step Guide (eBook)"